Back in 2010, when Lisette St. Louis created a “Sisters” group with Patty Pedersen and original member Olivia McLean (later replaced by Marty Kolls), the idea was not just to recreate enchantments of an historical songbook; rather to create an individual sound, and clever arrangements which would encapsulate the trio’s eclectic influences. After finishing a music performance degree at the University of Western Ontario, Lisette St. Louis went on to voicing animations, acting and singing in children’s television shows and fronting jazz and rock bands in both Seoul, Korea and Toronto, Ontario. Graduating from The American Musical and Dramatic Academy in New York, Patty Pedersen went on to sing and dance on various cruise lines traveling the world, then found herself starring in several musicals in Toronto, Ontario. After completing a degree in vocal performance at Western University, Marty has made a name for herself in the contemporary music scene as a singer song writer in Toronto and London Ontario. This Toronto-based vocal trio brings three part harmony into the modern age with a repertoire that includes everything from “Boogie Woogie Bugle Boy” to "Eye of the Tiger." Dressed in 1920’s-1960’s style wardrobe, the three sing like The Andrews Sisters with inspiring harmonies and perform classics such as “Mr Sandman,” and “In the Mood,” but what makes the Bettys truly stand out are their show-stopping interpretations of more current tunes like: Aerosmith’s “Dude Looks like a Lady” and Hall & Oates “Maneater." 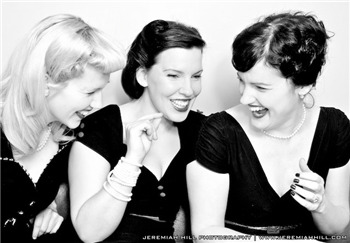 The Bettys cite everything from Marilyn Monroe to Nine Inch Nails to the neo-Burlesque movement as influences.